comic book you're likely to read." and wry sci-fi punk is utterly sublime." with each issue of this series – and goes even further with issue #9.
keeping you engrossed in the story and craving more." READ SHAWN VOGT'S SPOILER-FREE REVIEW OF ALL 12 ISSUES OF BULLET GAL HERE! "These are amazing books by Andrez Bergen, both in storytelling and art design. I cannot preach enough that if you are looking for a great independent creator to read then these are the books." This issue of Bullet Gal is another sidetrack from the main story. Previously, series creator Andrez Bergen did this in Issue #5 to give us the origin of Brigit, the murderous French femme fatale. This time, it’s to give us the origin of Heropa, the city where they all live—or are programmed into. Yes, Heropa is a computer simulation, existing in the world of Bergen’s first novel, Tobacco-Stained Mountain Goat. And, the creator of this simulation? None other than Lee, the duplicating superhero who is both Bullet Gal’s former mentor and current mentor. The story of Heropa unfolds as the story of Lee, a man living in a dystopian Melbourne, but who has a love of Japan, as well as of Silver Age comic books. One can only speculate as to how Andrez Bergen came up with a character like that. The story is great. Much as I love the ongoing Bullet Gal story, I think that the two tangent issues are my favorites so far. Of course, while they deviate from the ongoing sequence of events, they’re still very much a part of the story. They shed more light on the characters and the world that we’ve come to know, and they do it in an interesting way. The visuals are also particularly good in this issue. It’s done in the same digital photo montage style as the previous issues that gives it a gritty, noirish feel. This issue depicts a completely different world, though. As such, it adds the dystopian future element, including a use of color similar to Bergen’s Tobacco-Stained Mountain Goat graphic novel. Those who have read Bergen’s novel, Who Is Killing the Great Capes of Heropa?, will be particularly interested to get the city’s backstory in this issue. 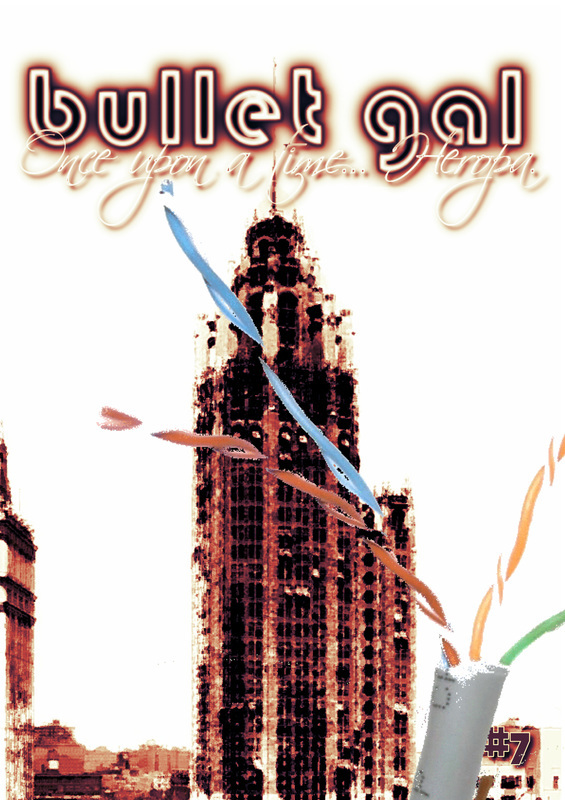 Those who haven’t read it will still enjoy the dystopian story of love and tragedy that’s presented in Bullet Gal #7. Bullet Gal #7 is available in both digital and print forms from IF? Commix. The Oxford Dictionary defines the word serendipity as follows: noun., the occurrence and development of events by chance in a happy or beneficial way; a fortunate stroke of serendipity [count noun]: a series of small serendipities. “A vast, homogenized city patrolled by heroes and populated by adoring masses. A pulp fiction fortress of solitude for crime-fighting team the Equalizers, led by new recruit Southern Cross – a lifetime away from the rain-drenched, dystopic metropolis of Melbourne. Who, then, is killing the great Capes of Heropa? In this paired homage to detective noir from the 1940s and the ’60s Marvel age of trail-blazing comic books”. He had me at ’60s Marvel Comics, but I wasn’t sure how he was going to weave in ’40s detective noir. Not very many pages into the book the ‘how’ became clear. This book was just the beginning of the story of Heropa and her denizens, or was it? The ‘small serendipities’ of finding Bergen’s work through chance assignment and our common interests resulted in my meeting a writer who I find both inspirational in his work, and prolific in his work ethic. I have since read all of his work which includes novels like Depth Charging Ice Planet Goth, graphic novels like The Tobacco Stained Mountain Goat, and comic books like Bullet Gal. Without any spoilers, I can tell you that through Bergen’s writing we meet many interesting characters in Heropa. Some of them come to a tragic end, as you might assume from the title of the novel that started it all. In Bullet Gal #7 Bergen changes the whole game. From the beginning I wondered why Heropa was such a strange amalgam of times, places and events. Bergen gives us something in Bullet Gal #7 that fans of other mediums, for example television’s Lost, never get… answers. This seventh of twelve planned issues begins the story of how Heropa came to exist. As I started to read the story I thought Bergen was telling an autobiographical story of how the setting was created in his mind. Even after I finished reading it I still think there is some of the real Bergen in the story. I think that kind of honesty and internal connection is necessary for a work to feel real. As always the writing style that Bergen uses is simple dialog. He speaks directly to you, drawing you into his world. His characters aren’t overly developed leaving the reader with plenty of mystery, but still enough to connect with them and actually care what happens to them. Bergen uses a style of sequential art that is pretty unique. He combines pre-generated art, photographs and original art to create a canvas that can almost tell the story without the words. It’s dark and gritty and sometimes even confusing, but in a way that makes you want more. If you love Bergen’s stories about Heropa as much as I do then more is exactly what you want. I have great news for you! Not only will Bergen release five more issues of Bullet Gal, he has successfully completed his second Kickstarter campaign which will fund the collection of all twelve issues into a massive graphic novel. Bullet Gal #7 will be available later this month. You can download it and other individual issues of Bullet Gal as well as other Bergen comics at the If? Commix website for just $1, or paper versions for $5. Don’t forget to order your copy of Bullet Gal: The Complete 12-Issue Collection while you’re there. The latest issue of Bullet Gal is out this month with #7: Once upon a time…Heropa. It’s so kind of Mr. Bergen to take you on a nice safe trip with his story. He takes you down a trail were you start to feel comfortable with where he is leading you, that’s when you feel the first few bumps in the road that make you start to question how safe you really are. Wait, this is all taking place in a virtual world? No, what I’m saying is that it changes everything from the story to the art for the reader. Now Andrez’s beautiful stylized art of famous movie stars, cityscapes, and old cars are not just for telling the story, they are the story. When you see a panel with Marilyn Monroe, or Al Pacino, you’re no longer seeing an image you think the author is using to represent the script, but instead you’re looking at the script. At the story! He has created a book where the fourth wall is nonexistence and you feel as if you’re standing inside the story with Bergen standing next to you smiling. But once again that big bump comes and we are off on another trail. With issue #7 we are taken from the storyline and lead into another inside Andrez brain where he reveals the man behind the curtain. In this issue, more than any other, you can feel the hand of the author guide this story and leave a little of himself on the pages; as we are taken, supposedly, into the “real” life of the person who has created Heropa and given the background of why he did it. It seems in this future Melbourne is the last major city left, and the creator of the dystopian city of Heropa spends his time building virtual training programs, loving the lost culture of Japan, reading golden age comics and creating, in secret, his fantasy world. He was married once, to his true love, but like the rest of the world she died. But unlike everything else he could not give her up, so instead of letting her go he uploaded everything about her into the program. In a freak accident the server in which he created Heropa and placed his wife crashed, and he lost her again. This time he would go find her! These are amazing books by Andrez Bergen both in storytelling and art design. I cannot preach enough that if you are looking for a great independent creator to read than these are the books. You can find them for sale at the IF? Commix web site for $5 for printed copy or digitally for $1. Also, at the end of March you can find the entire 12 issue collection published by Under Belly Comics. Plus if you are craving more Bullet Gal or Heropa stories then I suggest checking out the novels Depth Charging Ice Planet Goth and Who is Killing the Great Capes of Heropa?, both by Bergen. Who is Bullet Gal? What is this world we’ve been traversing? Those are some of the things brought up in Bullet Gal #7 by Andrez Bergen. From the get-go we’ve been following along the exploits of Mitzi and Lee – a couple different versions of Lee that is. The art style in this series is something Bergen uses to create an even bigger story in issue #7 (won’t spoil it, but it’s awesome!). As you read you’ll notice the artwork consisting mostly of images run through various filters – why is the artwork like this? Read to find out! In the beginning of this series the real reason behind Mitzi’s and Lee’s encounter may not have been clear until now, however we did discover what kind of world we were in. This is a world based off superheroes. A world where you get to choose whatever ability you want as you enter – for example Lee has the ability to “clone” into a number of different versions of himself. In this issue the artwork takes a bit of a spin compared to previous issues as the story also takes a major twist. There are some great pages packed with images during the “explanation” process. One of the pages features the mind behind Heropa going throughout his everyday life as we witness what makes him tick, as well as what his interests are – we also discover what’s been happening to the world outside Heropa (the story is taking place in Heropa). The story of Bullet Gal busts wide open in issue #7 as we’re shown just how much time has gone into crafting the world of Heropa – and what its true intent really is. "Reveling in the noirish voice that series creator Andrez Bergen both loves and excels at." Take a forties crime drama, mix in just a tad of superhero talk, and you have got the basis for Heropa, the primary setting for Bullet Gal #8. A lot has happened to turn the city on its ear but, as always, life tries to return to normal. In a dangerous city, sometimes shooting first and asking questions later is the only way to survive. Appearing at first to be disjointed, our story picks up with the inner monologue of one of Heropa’s finest. Seeking out criminals is pretty standard fare for a detective in the big city, but after last issue’s game changer of a plot twist nothing is ever going to be normal again. I wish I could tell you about it, but I cannot bring myself to spoil it for you. Sorry! What I can say is that our title character is still alive (mostly) and the world is not always what it seems. In what has to be one of the best noir comics I have ever read, I was stunned by the turn of events and found myself getting more excited to see where the story is going next. Andrez Bergen is phenomenal at his job, since apparently his job is to keep me on the edge of my seat and guessing as to what will happen next. Bloodshed and violence are everyday occurrences in the world but he makes it seem darker, more suspenseful. His use of filters and shadowing in the art and photographs throughout the comic lend it an almost ethereal feel while still seeming completely plausible. I’m reminded of Sin City but in a much more authentic and grittier way, not to say they are anything alike. I’m just using that to compare the ambiance of Bullet Gal‘s setting. As this is the eighth installment in the twelve-issue series, you might feel a bit left behind if you were to jump in with this issue. However, as luck would have it, you can buy these digitally for a buck a piece! And if you or anyone you know loves suspenseful detective stories, this is definitely a treat. I was recently informed that the entire series will be released as a graphic novel by Under Belly Comics in March, too. I’m happy to see that because print versions are difficult to come by here in the States. With so many options to pick this series up, I cannot imagine why you haven’t done so! It’s a gem that many have yet to find. You might remember a while back I did an interview with Andrez Bergen on his maxi-series Bullet Gal (get all that information here), Andrez was kind enough to send me the series so far and I’ve had a great time reading through them. The whole series has been incredibly enjoyable to me, full of humour and meta references I don’t usually associate with the noir genre. With the launch of the newest issue at the end of this month I felt now was a good time to give my thoughts on the series by reviewing the latest issue. This is a much more traditional issue of Bullet Gal than last time, #7 had numerous mind bending twists and a very meta origin for the city of Heropa. While I was a little disappointed this story wasn’t continued (as I got really interested in that and didn’t expect the story to go that way) a traditional issue of Bullet Gal is still a pretty unconventional thing and full of entertainment value. The story this issue follows new character Bob Khan, a regular cop who has to clean up in a city populated with superheroes. It’s a return to a more grounded, noir story than some of the more crazy heights the book has reached, but Andrez makes sure to inject as much of his personality as possible into the tale to make it anything but traditional. Andrez has a great talent for making the book feel like a comfortable old noir story yet still points out clichés and tropes enough that you realise it’s its own entity. The back and forth between Bob and his partner Irv in particular showcase Andrez’s comedic talents, Irv’s suggestions that Bob invest in “monoculars” in particular evoked some audible chuckles. Of course, the biggest draw for any issue of Bullet Gal is Andrez’s unique photographic art style. It’s truly the stand-out feature every issue and is what grabs my attention first every issue. I can be a bit of a double edge sword at times however, while it is certainly unique sometimes Andrez is limited by what the images he has which can often lead to some confusion in what’s actually happening in the issue. While this issue is one of the better laid out issues, having a greatly cinematic style and laid out in such a way that the story is easier to follow, it can still be a little confusing at times. For the most part though, the comic still looks magnificent and never misses a moment to give a wink and nod to some famous images (one of my favourite video-game characters was actually a photo-reference this issue, but I won’t spoil it). I’ve used some of the images throughout this review, so you can decide yourself if it’s for you. Other than that, my only other real issue was with how quickly this issue flew by. It felt just as I’d came to like these new characters that the story was over, with only a few advancements made to the main plot. It’s a little disappointing, but there’s still four issues to go before the big finale so I’m confident Andrez knows what he’s doing and is just pacing things out before we get to the conclusion. Despite these minor grievances this series is still one I’d highly recommend to anyone looking for something a different. It works really well as a series, and at this point I’m really excited to see how it all turns out. You can find the newest issue on the IF? COMMIX website here, with the graphic novel of the whole series coming out soon following a successful kickstarter. "The two story telling tools, art and script, make this fictitious biography a point of view and story I would love to keep reading." After ringing in the New Year with a psychedelic-techno-induced glimpse into the dark wonderland of Heropa’s origins, Bullet Gal #8 pulls us back from the rabbit hole to relative normality, as Mitzi’s life hangs by a thread while two newcomers with vengeance in mind stalk the streets of the noir shrouded metropolis of Heropa. While last issue led us outside the box to explore the secret digital reality of life in Heropa, think hardboiled pulp-style adventure entwined within an eclectic noir-spliced version of the Matrix films, Bullet Gal #8 returns to the here-and-now to deliver a brooding tale of revenge and justice while Mitzi clings to life in hospital after being gunned down by Brigit’s hoodlums. This issue also introduces two new characters, the honest no-nonsense cop Bob and his loyal partner Irv Forbush. Meanwhile Lee, the man with seven identical duplicates, has to deal with the police investigation into recent events, and Mitzi’s life slowly ebbs away in hospital at death's door – or perhaps not? 'Blind Side' is a deeply evocative and intense issue of Bullet Gal from Andrez Bergen. The introduction of one-eyed cop Bob Kahn finds the dedicated law enforcer tracking down and dealing with the hoods that ambushed Bullet Gal – cutting her down in a hail of bullets and leaving her for dead in the gutter while the police turned a blind eye. Kahn’s lone trek through Heropa’s dark streets, taking in cruel graffiti, gives us a fascinating insight into this character. His world-weary understanding of how this vast metropolis woks, its history, and the justice he ultimately meets out to Mitzi’s assailants is honed by a time-worn matter-of-fact simplicity that gets the job done in this city where trust is a currency of little worth for those noble enough to clear up the mess the Capes leave behind. The clandestine meeting between Lee and Detective Kahn in Heropa’s Memorial Hospital is a stylishly crafted moment between the honourable eye-patched cop and the enigmatic doppelganger. Bob offers Lee a candid report detailing the “felons” demise; however, the detective also managed to gain information about the person behind the hit: French “femme diabolique” Brigit, the lover and personal assassin of ruthless crime boss Sol Brodsky. The tension between Lee and Bob is almost palpable, it seem to hang in their air like a cloud of cigarette smoke, and the uncanny symbiosis of their professions is portrayed as a necessary – though clearly unpalatable – alliance between those who must walk this blurred line of the law in order to bring justice to Heropa’s streets. Detective Kahn’s assumption that Brigit is the real driving force behind Sol’s empire is also bang on the money, and reinforces the deadly femme fatale's position as a major player in the shady echelons of Heropa’s underworld. We also get to see Kahn’s partner Irv Forbush towards the end of this issue. They clearly share a strong bond, it's evident they’ve worked together for a long time, and Forbush’s wry sense of humour polarises his view of Capes like Lee while simultaneously ribbing his boss over his visual impairment and lack of business acumen. Bob and Irv are a great double-act, their banter is snappy, and their introduction here certainly makes them a welcome additions to this IF? Commix title's diverse cast of characters. Bergen’s art for Bullet Gal #8 continues to push this series striking visuals to a whole new level of excellence. The stunning use of bold black and white imagery, a haunting blend of stylish photomontage and subtle digital enhancements, makes this one of the most impressive issues of Bullet Gal to date. With its Dadaist influences and diverse pulp-noir themes, Bergen’s work continues to impress on all levels. The bird feather that tumbles softly down the front cover exemplifies this — coaxing the imagination, it delicately passes unseen through the finer subtexts of the issue, before drifting back into view in time for the beautiful postscript that elegantly embodies Bergen’s artistic vision in the gleaming aesthetic of a single teardrop on the cusp of death. This issue wraps things up with a quick round-up of the reviews this innovative IF? series has received, along with a reminder of where it all began – the cover for the novel Who Is Killing the Great Capes of Heropa? Finally, there’s also 'Post To Pistolero', along some words from the writer and artist himself in Soapbox D’Andrez, a Bullet Gal pin-up by artist Joe Badon, and great back cover by L .@ .K.art. 2015 has already gotten off to a great start for Andrez with #8, and with the 348-page Bullet Gal trade paperback collecting the entire series — 'It’s Not You It’s Me' — from North American publisher Under Belly Comics already in the works, there’s never been a better time to check out Mitzi’s thrilling prequel series. Bullet Gal #8, is published in print form in January 2015 in Australia, along with the digital version, and available direct from the IF? Commix website. "From the artwork to the witty writing we’re given a story as if it were pulled from the minds of Chandler and Hammett themselves." Writer Andrez Bergen once again takes us into the world of Heropa, this time with an even bigger emphasis on the story’s noir theme. Heropa is a world set apart from your average noir tale, a world full of imagination and creativity, but issue #8 of Bullet Gal takes a different path than the previous issue and really uses its pages to pull us back into the noir lifestyle of its gritty detective. A quote from the text shedding more light on this is “We clean up the messes the capes have no time to do” – and from there our hero with the eye-patch goes looking for answers on the case. The artwork style in this issue is consistent with previous issues, the pages looking of various pictures and images run through filters. A page towards the beginning features the gritty detective in his search for answers, well, not sure if he’s actually searching, more like shooting for answers. The page consists of bullets flying and the blasts taking up numerous panels as “BLAM” is stretched out across the page. The page that follows shows the detective’s face in a lingering cloud of smoke as he says “Doesn’t make it any easier” showing a remorseful side to a character that tries to remain rigid in his pursuit of justice. Bullet Gal #8 pulls us into a very noir-centric story right from the get-go. From the beginning we’re told of the city as the narrator tries to avoid the usual noir descriptions. From the artwork to the witty writing we’re given a story as if it were pulled from the minds of Chandler and Hammett themselves. This is the second issue in a row that’s focused on characters other than our titular heroine. I kind of miss her. Still, though, there’s plenty to love about this issue, starting with what I’m pretty sure is an Apocalypse Now reference at the very beginning. In a series that’s been noirish all the way through, #8 is probably the noiriest of them all. It follows a hard-boiled, one-eyed cop as he investigates the shooting of Mitzi, a.k.a. Bullet Gal, all the while waxing philosophical in narration about, “Heropa: my city, my beat.” Our one-eyed detective is able to track down the goons that got the drop on poor Mitzi, but the dame that gave the order, Brigit, is still at large. Meanwhile, Bullet Gal lies dying in the hospital. Despite the absence of our heroine, this is a solid issue, reveling in the noirish voice that series creator Andrez Bergen both loves and excels at. We’re sadly drawing near the end of Bullet Gal’s adventures, but there are still a few issues left, and likely more than a few surprises. For any fan of noir and superheroes, this is a series you really shouldn’t miss. Once again, Bullet Gal pulls me away from the capes and tights to show me why I love comic books. I am a huge fan of art, any form ranging from a personal interpretation that you are supposed to derive the meaning of the work, or simply a beautiful landscape in pencil or paint or whatever it is. This comic made me relapse to a different tone of comics. If you are like me, you will love the way a creator of art can tell a story through imagery or how words can paint that picture for you. This issue was broken up into three methods of story telling; art alone, descriptive narration and combined. The narration is straight out of a classic noir or detective novel, with the relationship between the feature of the chapter and the city they will die for. As exhausted as the noir subject can seem with the same focal point usually being touched upon (including banter with partner or close friend) this had a different feeling to it as there was no great inner turmoil, just the facts and some spent bullets. If you want to enjoy a story through pictures that literally tell the tale, then you should Bullet Gal #8. If you want to read a great teaser narration that will keep you turning the pages, than you should Bullet Gal #8. As a single issue, there may not be a lot of information or much recapping of why we are following this memorable detective (if you want to make a hero or villain stick out, give them some kind of unique feature, I.e. An eye patch). As a collection (see other Bullet Gal issues) this story keeps the action and intrigue building, trying to get you to fall in love with not only this city like our detective is, but also to get you to see the noir style imagery and sell the scenes how you imagine them. The panels do a great job of setting the scenes, but I felt engaged as a reader to complete the action from frame to frame (which I hope is the goal of this project). Not just because the opening narration was worded in a way that warped my mind to a place and time where they would talk as such, nor because the images were dark or thrilling, but I felt like this comic was something that didn’t show or tell me the answer to the rhetorical “what does this painting mean”, but instead let me interpret it for myself. Remember those silent movies you watched as a kid? The black and white screen crackling as you sat their eating your Cracker Jack’s, impatiently anticipating the screen of dialogue to come up so you could laugh knowing the man said “That’s not how you give a haircut!” – Oh wait, do you remember that? I don’t… but this issue of Bullet Gal certainly does. Creator Andrez Bergen uses issue #9 to push this creative series into a new direction – how so? By leaving the entire issue free of dialogue! It’s something that might sound a bit risky, but it suits the artistic style of this series quite nicely. The story progresses (she’s up!) as we’re shown familiar faces while not given any spoken word alongside them. The artwork in this issue serves to bring forth the entire story, so there are quite a few scenes worth gazing into for extended periods of time (that’s a mighty fine cup of joe). The lack of dialogue doesn’t leave the issue completely void of words however, as the scene just described with the coffee mug gives us a bit of insight on the Heropa Hospital patient via a document seen in the image (one that will most likely be left with a coffee ring). Other images see old faces getting ready for their next big encounter (the golden gun!). The interaction with the images is fantastic to see as well. A scene featuring the flick of a cigarette out a window shows it ending up in the street and being run over by a car as a means to bring us to the next set of visuals – a creative means to transition from one scene to the next, almost as if watching a movie. Bergen continues to push creative boundaries with each issue of this series – and goes even further with issue #9. Even without words the story bleeds its noir roots, keeping you engrossed in the story and craving more. "I was stunned by the turn of events and found myself getting more excited to see where the story is going next. Andrez Bergen is phenomenal at his job, since apparently his job is to keep me on the edge of my seat..."